We are proud of our reputation of being more than just another printer. Our knowledge and experience continues to set us apart in Providence, with hundreds of companies reliant on our ability to deliver print management services of the highest quality. Our approach is to simplify complicated process into a language you can understand, demonstrating the direct benefits you and company will receive. 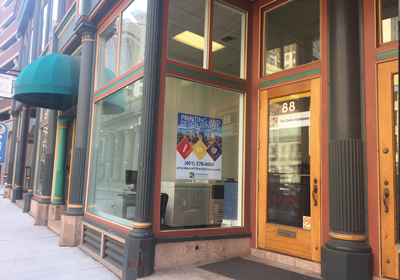 Located on Weybosset Street placed between Orange Street and Peck Street, our Providence team are able to guide you through every step of the print process giving you full control over the finished product. This applies to everything from canvas prints and roll-up banners, to catalogues, brochures and much more. Whether you need help identifying the right paper/board, or want to explore different finishes, you can trust in our Providence branch to get it right every single time. No project is too big or small for us to help and once we understand the parameters you need to work to you can focus on more pressing matters safe in the knowledge we’ve got you covered.